Before we get started today let's announce the winner of the Ultimate Hairstyle Handbook. It's Abby who said: Not only does the author have the most AMAZING name in the world that just happens to be the same as mine, she also has incredible taste in hair. I'm drooling over the pictures! Today's idea is very, very simple. I needed some more places to hang items to dry in the laundry room. I bought a few cute hooks and added them to a quote board I no longer liked....making this. Maybe it's just me, but I keep seeing these different signs I bought several years ago and I just don't like them anymore. They are awesome to repurpose, though. I sprayed this baby red and hung the new hooks on it. I found the umbrella hooks at JoAnn's for 50% off and I love them. I thought mounting them on the plaque would make them stand out a bit more. They kind of coordinated with the sign I made that hangs up close by. So now I have some more spots to hang the non-dryer items after they get washed. That's all for today. I have something fun to show you tomorrow. My mom's releasing her first pattern and it's a pretty easy one to sew. See you tomorrow. Thanks for being here. That sign looks SO much better than it did before. Not that there was anything wrong with it, but now it has purpose and POPS with that red and ties in with the whole scheme perfectly. I laughed when I saw the 'real' laundry shot. Gotta love that Man-Logic. I love those darling little hooks! that bike made me laugh! Cute hooks!! And I'm slightly jealous that your laundry room is big enough to fit your husbands bike--my husband keeps his "princess" in our bedroom for him to ogle over all the time And yes, he did name it princess, which means that he has never given that nickname to me or any of our 3 cute daughters. My husband has three bikes and they are all inside. All combined - they are worth more than our three cars and motorcycle combined. It's a sad, sad life. Glad to see I'm not the only wife that has a husband with a expensive bike he refuses to put in the garage! Ours is in a corner of our dining room and I swear that when I'm out of town it sleeps in my spot on our bed! Cycling men are so funny - gotta love em'. Thanks for the giggle today! I'm with all of you with your bike loving men. Bikes that expensive need a room of their own. yay! 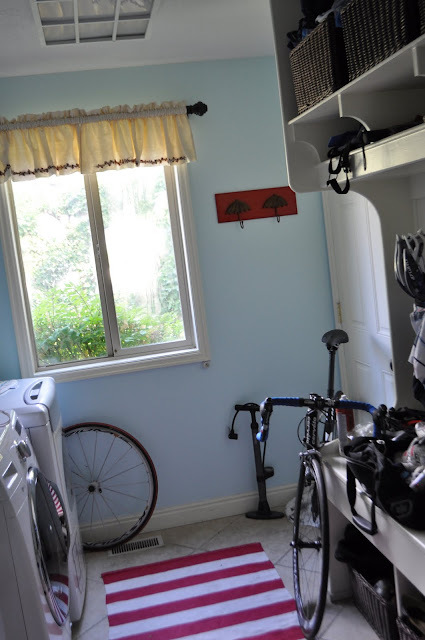 for not being alone in having a "my bike is above the garage" type of husband. Love the fun pop of red and that umbrella sign is to die for! Oh this is great! What a wonderful way to recycle!